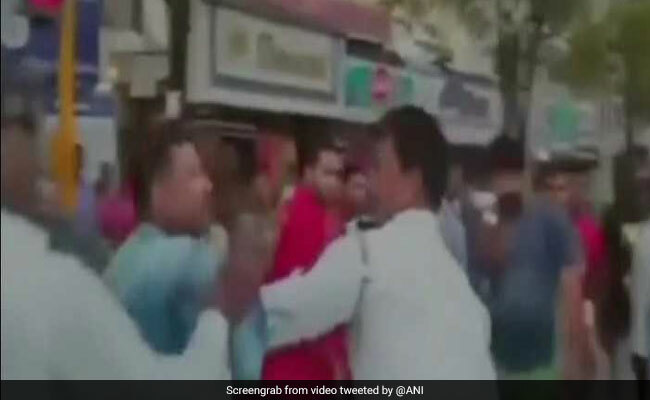 A traffic policeman in the Mumbai suburb of Vasai was assaulted by a biker for doing his job. The cop stopped the man for reportedly jumping a traffic signal. A video of the incident, that reportedly happened on Monday, has now gone viral. The 15-second clip shows the accused slapping the policeman twice during an argument. The accused was on his two-wheeler with his wife and child when constable Kalu Vitthal Munde stopped him for allegedly jumping a signal at the Parvati Cross Area in Vasai. The man argued that he didn't flout any traffic rules but when the policeman didn't relent, he slapped the constable, twice, in the presence of several bystanders. The accused was taken to Manikpur police station after locals overpowered him. "We have registered a case under section 186 (Obstructing public servant in discharge of public functions) against him and released him after warning him," Anil Patil, senior inspector, Manikpur police station told Mid-Day.